Sound is the part of an acoustic field that an animal hears. An acoustic field consists of a propagating pressure wave, generated from particle motions in the medium that causes compression and rarefaction. Sound travels with little attenuation in water, and basically all multi-cellular aquatic organisms have evolved sensory systems to detect and process either the pressure or particle motion component of a sound field. Hearing is therefore an essential sensory modality in many marine taxa to be used for navigation, prey finding, predator avoidance and intra- and inter-specific communication. Most mammals, including man, detect the pressure component of a sound field, and there is therefore often an anthropocentric bias towards assuming that all animals compose their auditory scene from the same frequency span of sound pressure fluctuations as humans. However, many animals have an acute sensitivity to ground or water borne vibrations, and they have evolved auditory systems that are sensitive to the particle motion component part of the sound field that we as humans are quite insensitive to. Secondly, animals that use sound to actively gather information about their surroundings by emitting sound pulses and listening for returning echoes in a process coined echolocation use ultrasound that humans can only detect by using special equipment. The first step in trying to elucidate how animals use sound in the wild is therefore to understand the basic biophysical conditions under which animals of different sizes and in different media may produce and receive sound, and dispense with outlook of the quite poor auditory performance of a large primate, homo sapiens, who relies primarily on vision. One example of a current research topic, involving sound stimuli that humans cannot detect and therefore have a hard time relating to, is the predator-prey interactions of echolocating toothed whales and their cephalopod prey. 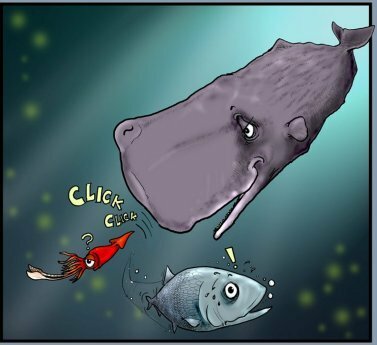 Toothed whales emit very powerful ultrasonic clicks to generate detectable echoes from the squids they are trying to echolocate. The squid cannot detect the ultrasonic echolocation clicks, but are on the other hand very sensitive to the low frequency particle motion head wave generated by the approaching toothed whale. Thus, to study this acoustic interaction we most use special equipment that can measure 1) the ultrasonic echolocation clicks and how they are reflected off the soft squid bodies, and 2) the water displacement ahead of the whale, and how the squid may detect and respond to that head wave. Studies of such an interface require a combination of field and laboratory studies and development of new research equipment, and allow us to formulate new questions about how and why aquatic animals produce and use sound the way they do.